When spring finally comes here in the northeast it can sometimes feel like a race against time. After waiting months for the return of the green, the plants seemingly pop-up all at once, with wonderful exuberance, and at a pace that few of us can keep up with. Harvesting spring greens- if you let it- could easily be a full-time job! And there’s not only the challenge of collecting all your favorites during their prime harvest windows, there’s also the challenge of preserving the spring harvest because it’s simply not always possible to eat all the greens at once! Enter fermentation, a form of food preservation that was developed and utilized by our ancestors for just this situation. What I love about fermentation is that it’s living medicine, and while I love making wild salad, pesto, frittata, soup, vinegar, and more with the wild spring abundance, there’s something special about knowing that the food you’ve prepared is probiotic and teeming with beneficial microbes that we enter into a reciprocal relationship with when we take them into our bodies. Symbiosis is a beautiful thing! You can read more about the benefits of probiotic foods in my recipe for New England-Style Kimchi, and read-on for my recipe for preserving some of my favorite spring greens in a seasonal-inspired sauerkraut. First-off, this recipe is meant to be played around with. If you don’t have access to one of the greens in the recipe it’s ok to leave it out or substitute it for something you have an abundance of! Start by chopping your cabbage. Pile it into a big bowl and sprinkle with about 2 tsp of the salt and begin massaging it with your hands. The cabbage will begin to breakdown, releasing its juices which becomes the brine. Once the cabbage is thoroughly massaged start adding the Nettles bit by bit, along with the remaining salt, and keep massaging. You can wear gloves for this part if you’re worried about the sting (which will be rendered harmless by the fermentation process). Once you’ve added all the Nettles, add the Garlic Mustard and Chives and mix and massage thoroughly. Next choose your vessel- a fermentation crock or widemouth mason jar will work. Pack the ‘kraut into your vessel and press in with your hands or use a sauerkraut stamper (also called a pounder or tamper) until the brine covers the ‘kraut. Use a heavy lid or small plate with a sterilized rock on it for the crock or mason jar to keep the brine levels over the veggies, or another good trick for this if you don’t have a small lid is to fill a ziplock bag with water and use that to keep ‘kraut below the brine level. Lastly, you can always make brine to top-off the sauerkraut by mixing 1 1/2 tbsp sea salt with 1 quart water. The bottom-line is that the brine level needs to be over the veggies. Now you sit back and let it ferment! Fermentation time will vary based on the weather, but start checking it after a few days to track its progression. It’s ready when it tastes sour, crunchy, and still salty, but not nearly as salty as it tasted when it first started fermenting. Then put it into a jar with a lid and keep in the fridge or your root cellar, if you’re lucky enough to have one! Enjoy as a condiment, with sandwiches, with breakfast, with a heavy meal, as a base for salad dressing, on a picnic, or even as a simple snack. Happy spring and happy fermenting! 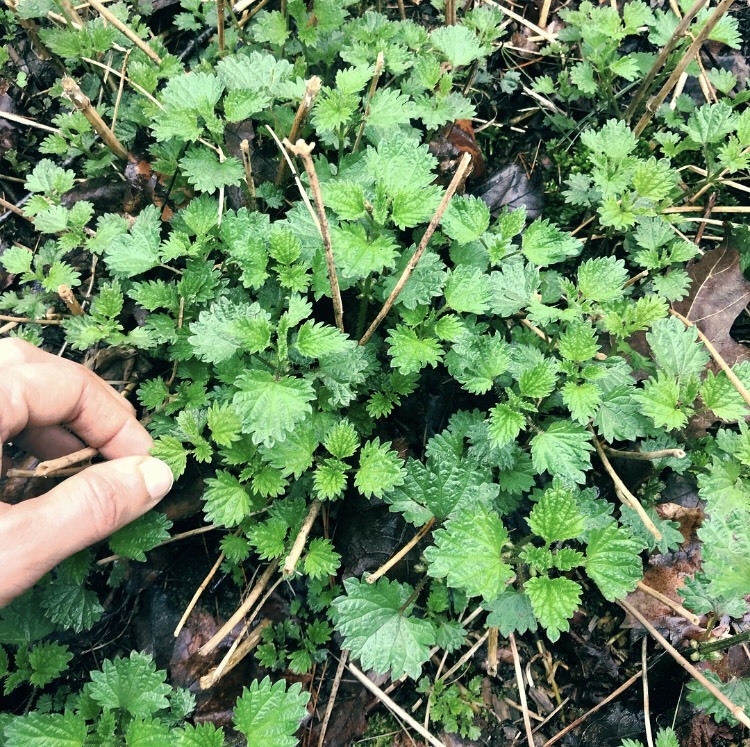 And for any of you wanting to learn more about working with our locally abundant medicinal and edible plants, the summer and fall sessions of our bioregional herbalism series, From the Roots Up, is OPEN for registration! This hands-on course meets outside and in the field and focuses on field botany and plant ID, medicine-making, gaining intimacy with our local plants, reading the herbal landscape, materia medica, and so much more! Lately, this soup has been saving my life! So much so that I just had to share the recipe. During seasonal transitions, especially our current one from late summer to fall (and the on-coming fall to winter), our immune systems need some extra support. And it seems like just about everyone I know is either navigating through or has already dealt with their first cold of the season, myself included! Twice over the past two weeks I’ve caught a small cold. 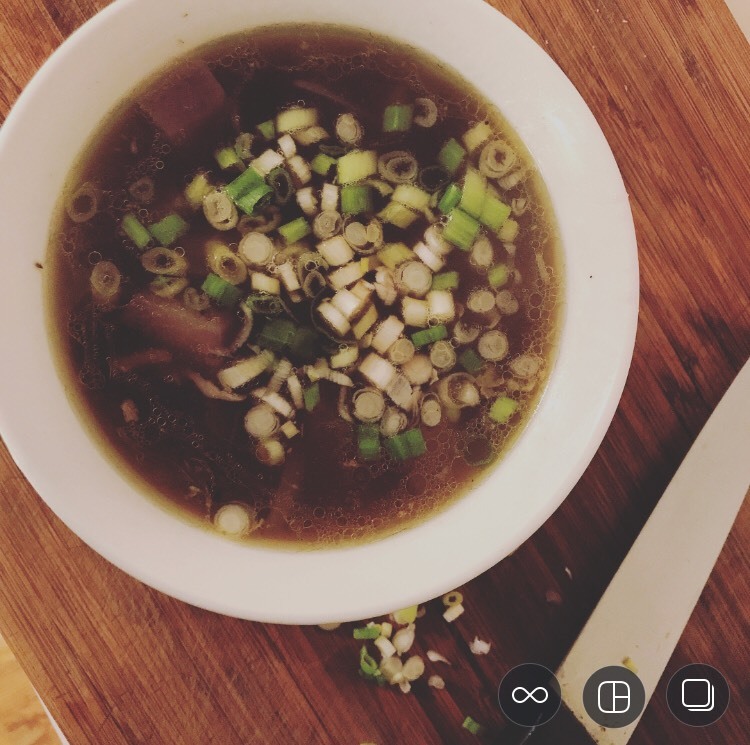 Both times I made a big pot of this soup, had 2-3 hearty-sized bowls of it in the afternoon and evening, and woke-up the following morning with my cold completely gone. Like magic. Only its not magic, it’s food as medicine at its finest! Soups lend themselves incredibly well to healing spices, nourishing roots, regenerative seaweeds, and immune-modulating mushrooms. Read-on for my recipe for the perfect fall soup to nourish your immune system and tend to your health during this seasonal transition. NOTE: If some of these ingredients are new to you don't worry! They are available at most co-ops, health food stores, and grocery stores with good produce sections. Burdock is also often readily available at many Asian food stores under the name Gobo. Maitake is often available dried and you can use this form of it- simply re-hydrate by soaking in water for about 1/2 hr and then cook it as specified in the directions. And you can also use dried burdock for this recipe, just cook it longer than the directions specify to be sure it's nice and soft when you eat it, and use 1/4 cup dried instead of a full cup of fresh! Start by sauteing the garlic, onion, ginger, and maitake in olive oil or ghee until soft. Next add the burdock, daikon, tamari, kombu or kelp, and water and/or broth. Bring to a low simmer and cook about 10 minutes until the daikon and burdock are cooked. Garnish with 2-3 tbsp of chopped scallions. This soup has a rich, earthy flavor and the addition of a squeeze of lemon will brighten it up a bit, if desired, but it's not necessary. 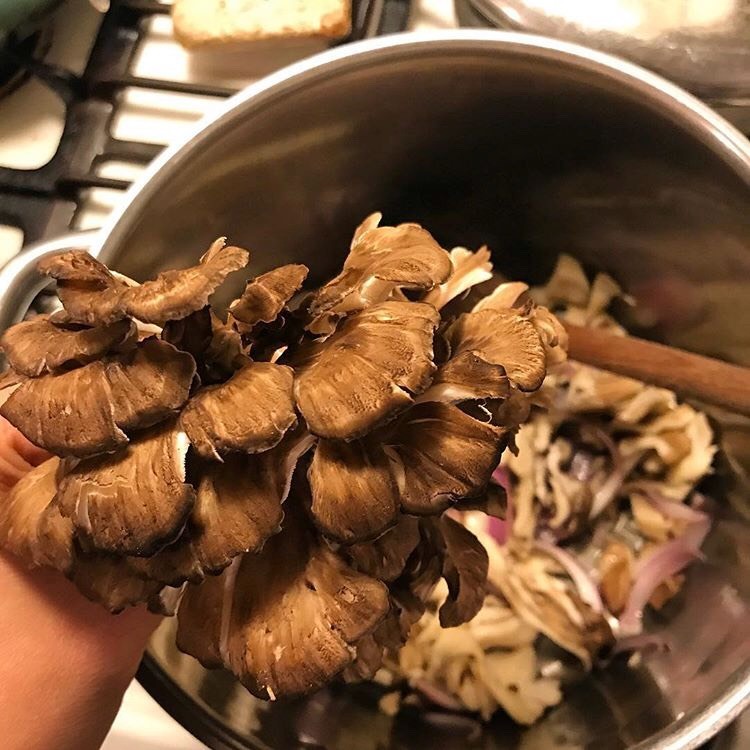 For folks who don't like to eat mushrooms, simply simmer the maitake whole in the broth and remove before serving (best to cook it all for longer-30-45 minutes). It doesn't make the broth "mushroomy," just rich and delicious! This soup is building and supportive to your immune system. Turn to it when you feel like you're coming down with something or when you're already sick and need some strong immune support. I also love making it when I'm at the tail-end of a cold or flu and want a strong final boost to my immune system to really get the remnants of that virus or bacteria totally out of my system. It can also be relied on as a powerful preventative during the fall and winter months to keep the immune system ready and primed. Try making it once a week for this use. Maitake mushroom has a long tradition of use as an immune-stimulating and modulating herb, and has even been shown to have some cancer-fighting effects. Burdock Rt (Arcticum lappa) is another "food as medicine" from herbalism that can be eaten or taken in the tea to help support all the eliminatory pathways in the body, especially the liver, kidneys, and skin. It’s also extremely nourishing, rich in iron, calcium, magnesium, and many trace minerals. Daikon radish is pungent in nature, aiding digestion, and is also extremely rich in vitamin c, providing still more of an immune system boost! Garlic, onions, and ginger add immune-boosting essential oils, anti-bacterial and anti-viral support, and in combination this soup makes a delicious and medicinal brew. Enjoy! If you’re interested in learning more about kitchen medicine our winter of 2019 online course, Spice Rack Medicine, will be open for registration soon! Topics will cover all the same subjects in our in-person course (currently full for 2019), including the medicinal uses of the culinary herbs, medicinal mushrooms, seaweeds, food and herbal energetics, cooking with the tonic herbs, eating with the seasons, medicine-making, and more. Learn more about Spice Rack Medicine Online here! Have you met Autumn Olive (Eleagnus umbellata) yet? I absolutely love this plant. It’s abundant, easy to harvest, is insanely good for you, and is wild plant we can harvest without concern of overharvest since it’slisted as “invasive” in many states (I prefer to call it “opportunistic”). Also called Autumn Berry and Japanese Silver Berry, this northeast superfood was introduced to the US in the 1830's. It’s endemic to eastern and central Asia, including parts of the Himalayas where it is a traditional food, and has now thoroughly made itself a part of the northeast ecosystem. But they’re not just in New England! Autumn Olives can be found growing south to Florida, in the Great Lakes Region, and west to the Mississippi River. The Pacific Northwest also is home to these prolific shrubs. Identification: ID is easy- the medium to large shrubs have alternate leaves that are silver on their undersides, sometimes have thorns, and bear small, fragrant, cream-colored, 4-petaled flowers in the spring. The berries are red with silver speckles- one of our favorite nicknames for them is “Sparkle Berries”! One poisonous look-alike is Honeysuckle (Lonicera spp)- but those shrubs don't have silver leaves and the berries don't have the silver speckles, plus Honeysuckle berries ripen in the summer not the fall. If you find a bush with silver, alternate leaves with silver-seckled berries, you’ve got Autumn Olive. Harvest: Autumn Olives ripen in the fall-Sept through Oct here in New England. 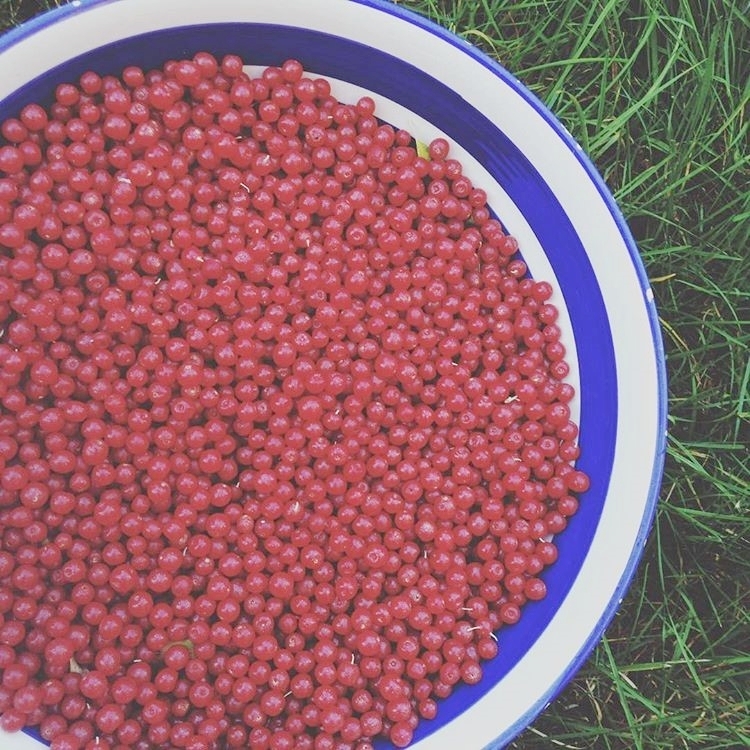 They are sour and sweet (like most berries) and get sweeter with cool nights and a frost. Flavor can vary quite a lot from bush to bush, so taste each one to see which is to your liking and harvest from that one. You will find them growing everywhere! But they especially like hedgerows, old fields and farms, and any area that was disturbed in the past. They are an early successional species and are especially abundant in fields in my area that are transitioning from meadow to forest. Be sure you’re harvesting from an area free of chemicals and remember to practice reciprocity in your harvest. For more on this look to my article “Wildcrafting, Wildtending, and Reciprocity” on this blog. Nutritional Value: Nutritionally, these berries are just awesome. Amazingly, they are the highest known source of the potent antioxidant lycopene, which is cancer protective, anti-inflammatory and promotes longevity. The primary way the average American gets lycopene in their diet in by eating tomatoes, however Autumn Olives have been shown to contain up to 17x more lycopene than tomatoes! The berries are also rich in vitamins A, C and E, flavonoids and essential fatty acids. And they're free. What to Do With Them: There are sooooo many ways to preserve the abundant Autumn. I’ve made jams, added them to applesauce, made into and incredible sweet and warming fall cordial, frozen for smoothies and baking, and of course they’re also just super yummy and safe to eat raw. They also make a great substitute for tomatoes for folks with Nightshade sensitivities. But one of my favorite ways to preserve them is in fruit leather and I’ve found that their sour flavor profile combines especially well with the sweetness of apples, which also happen to be in season the same time as Autumn Olives, making an amazing bioregional, localvore treat! Step 1: Start by combining your Autumn Olives and Apples in a pan with just a tiny bit of water. Chop the apples into small 1-2 inch pieces. It’s ok if some of your Autumn Olives have stems attached to the berries but be sure not to include larger twigs or leaves. If you have more than 2 cups of Autumn Olives, then use a ratio of roughly 2/3rds Autumn Olive and 1/3rd Apple. Cook it all down on low with a little water, stirring often to make sure there's no burning happening on the bottom. Step 2: Once it’s all cooked put the entire mixture through a food mill to remove the apple seeds and Autumn Olive seeds. NOTE: You don’t have to do this part. If you don’t have a food mill then be sure not to include any apple cores since otherwise you won’t be able to easily remove the seeds. And having the seeds of the Autumn Olives is simply a matter of preference. They likely have some nutritional value and are not at all harmful. For some folks they just like the texture better with or without. The picture here of my fruit leather contains the seeds- if you look close you can see them! Step 4: Line a baking tray or oven safe pyrex dish with parchment paper and spread your pureed Autumn Olive and Apple mix thinly (1/2-1 inch thick) onto the paper. Bake at 170 degrees for about 6 to 7 hours, being sure to check it often, since sometimes the edges burn a little bit...if the edges are burning and the center is still moist keep cooking it, knowing that you’ll just have to trim off the edges but the majority of your fruit leather will be perfect. Try it as you go, since it’s "to taste" in terms of how leathery you want your fruit leather to be. I like mine still pliable and not crisp. Basically you’re going for the consistency of fruit roll-ups! 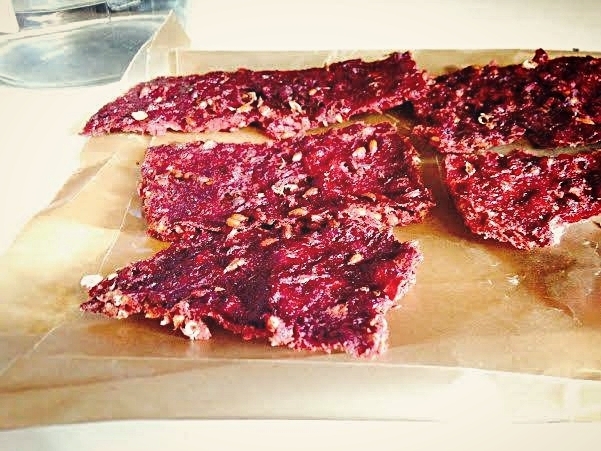 NOTE: if you have a food dehydrator you could use that for this recipe instead of the oven! Store it between wax paper in the fridge where it will stay fresh for weeks, or freeze and take-out as needed. Enjoy your local, free, nutrient-dense, antioxidant rich super- food fruit leather! And if you want to learn more about food as medicine, the medicinal use of the culinary herbs, medicinal mushrooms and soooooo much more, check-out my Spice Rack Medicine Winter Series. Class meets 1 sunday/mo January- March and registration is OPEN! It will fill-up so sign-up soon if you’d like to join us!